A dry scalp is a common problem, particularly among those who also suffer from dandruff or live in harsh climates with low humidity. Using a lubricating product like Vaseline, a brand name of petroleum jelly, may help relieve some of your scalp dryness, but it can also cause other problems. Ask a dermatologist what treatments are best for your dry scalp, and also discuss any additional scalp problems you experience in conjunction with the dryness. Many people are born with dry skin and scalps, and this can be exacerbated by a variety of factors like cold weather, wind, showering in hot water, and using shampoos and hair products that contain harsh or soap-like ingredients, says DermNet NZ. Dandruff and similar conditions can cause the skin on your scalp to flake, which produces itching and irritation in addition to dryness. Vaseline is an emollient that can shield your skin from the elements that can make dryness worse. It forms a protective layer on your skin to keep the moisture in and the irritants out, working to hydrate your skin throughout the day and protect it from drying out further. It claims to help your skin nourish itself naturally and get rid of any chapping or irritation associated with dryness. According to the American Academy of Dermatology, using a pomade or oil-based product, like petroleum jelly, can help moisturize your scalp, but it may also aggravate dandruff and make the problem worse. Furthermore, if you get the Vaseline on your forehead, it may clog your pores and cause breakouts. Oil-based products can also lead to a bacterial scalp infection known as folliculitis, which is characterized by red, pus-filled bumps around your hair follicles. To avoid triggering acne blemishes on your forehead, apply the Vaseline at least 1 inch behind your hairline. 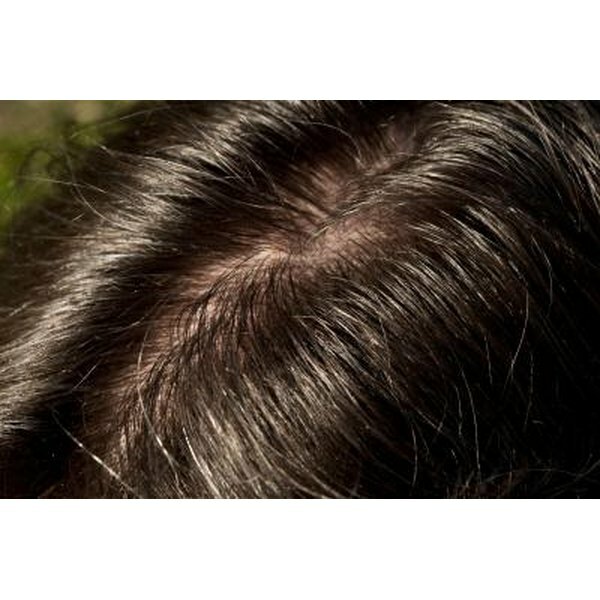 If you notice it begin to irritate your scalp or cause folliculitis to develop, stop using it and contact a doctor. If you experience dandruff along with a dry scalp, shampooing with a product medicated with zinc pyrithione or tar can help control this condition. If your scalp is red and inflamed or you notice your hair begin to fall out, see a dermatologist and tell him about all the symptoms you are experiencing. Similarly, if you experience any adverse reaction to Vaseline, discontinue using the product and seek medical attention. Discuss home treatments with a doctor before you start applying them.